Curiously, in spite of the consumerisation of worship, and the demands for *active* participation by everyone in everything and the flattening egalitarianism of modern *ministries*, the man in the pew (having arrived in the Clapham omnibus, no doubt) doesn't realise that in traditional worship there is a sense in which it is already all about him. For whom are the Mysteries offered, for whom do the clergy and servers shuffle about, process, sing, kneel, pray? For whom do choirs sing and altar guilds fuss and cleaners sweep? For whom is the temple designed? For him, for the man in the pew. The most important person in the church is precisely the man in the pew, the worshipper rapt in worship and devotion. To stand and pray before God and offer him worship, adoration, devotion is the highest of human activities - and all the actors and all the props are just there to enable that, to lead him into that Mystery. Now I suspect that this may be a case of "both...and..." rather than " "either...or..."
but I must confess I was expecting Him . . . He whom the earth and heavens adore . . to be the first answer to your question! 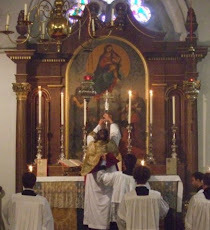 The primary purpose of Catholic worship is to glorify God - ''Glorificatio Dei''. God enables us to glorify Him by putting into the priest's hands His own Divine Sacrifice, which the faithful join themsevles in offering. The secondary purpose of Catholic worship is our own deification, sanctification, which is brought about by devout participation in the Sacrificial Worship and, chiefly, by reception of the fruit of the Sacrifice, which is Communion with the Victim and Offerer, the God-man Jesus Christ. If worship is to be authentic and fruitful, the priest and faithful must put God at the centre of their worship: only by giving first unto God that which is due Him (Sacrifice Worship, which He Himself provides!) can we become receptive to God's gifts to us (forgiveness, sanctification, union with Him, as well as temporal favours). Most protestants have no such Worship, no such Sacrifice, no such Sacrament, and do not perceive at all their need for such things, nor our insistence upon them. Alas, as Fr.Hunwicke recently wrote, most post-conciliar Catholics have also become de-facto protestants.